By Kate Allen | From December 2008 to March 2016, I had the pleasure of leading more than two dozen Desert Committee service trips in Death Valley National Park. These were sponsored to help restore wilderness values in the 91% of the Park that is designated wilderness. The ranger responsible for directing the projects was Wilderness Coordinator Charlie Callagan. Charlie determined what kind of work, and where it was to be done, as well as where the group would camp. As the Sierra Club leader, I was responsible for signing up volunteers. Credit must be given here to George Barnes, who introduced me to Charlie in the fall of 2008. There would have been no trips without this introduction. Photo above: Disguising Illegal Routes. Photo by Kate Allen. There were a variety of projects, including disguising illegal off-road routes, picking up trash at back country cabins and debris at plane crash sites, trail work, and hauling irrigation tubing out of marijuana grow sites. There was one trip to remove an artificial water source that was no longer needed and another trip to trim mesquite along the West Side road. The trips drew a variety of participants. Most were retired, but there were a few still working. Our volunteers were from as far away as northern California and from as near as the park itself. Attendance ranged from as few as five people to as many as sixteen. Our first trip was to Saline Valley; where we camouflaged several illegal off-road routes. The idea was to make the tracks much less obvious, so that drivers would not be tempted to follow them. We did this by placing some brush and vegetative litter to simulate growing plants. Mostly we raked the road surfaces to roughen them up and added rocks to make them blend in better with the rest of the scenery. We worked at Salt Lake to repair damage done by visitors getting their car unstuck from the mud on the lake shore. Then we stopped at a couple of other illegal routes to do some disguising and signing before making our way to the Warm Springs Campground to set up camp for that night. That afternoon we worked on a couple of routes north of the campgrounds; one where Steele Pass road had a redundant route and the other on an illegal route into a wilderness area. Then we headed back to camp and a potluck dinner. The next day we headed back to Highway 190, stopping several places to disguise more illegal routes and rake out tracks in Saline Dunes. Subsequent trips would involve more disguising and signing of illegal routes. 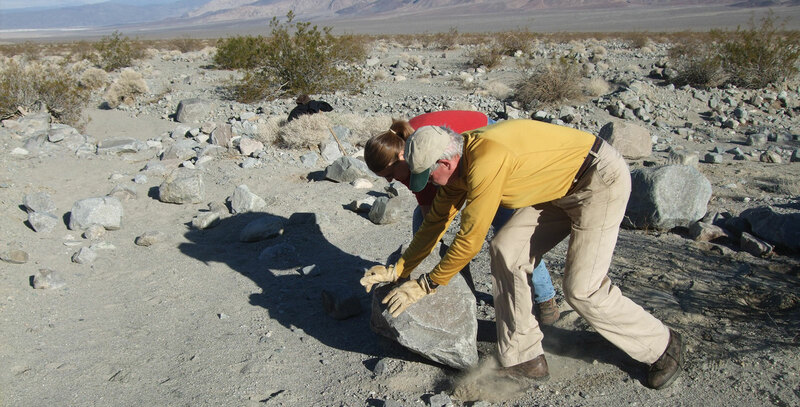 We worked in almost every corner of the Park, including the eastern border in Amargosa Valley, the Panamint Mountains, the south area of Salisbury Pass and Ashford Canyon, and in Cottonwood Canyon. We did some route work in central Death Valley itself near Red Wall Canyon and in the Eureka Dunes area. On our very last trip with Charlie we spent an afternoon raking out tracks created by visitors who had driven off Highway 190 near Stove Pipe Wells. Work locations in Death Valley National Park. As you can see, much of our work involved raking out of vehicle tracks – some left by illegal off-road use and some by mining companies as they withdrew from their claims in the park. There were a few trips in Twenty Mule Team Canyon, as well as ones in Eureka Valley. Sometimes the tracks were deep and required more than just raking. If the tracks had an edge to them, the method was to scrape the edge off and into the track, then break it up to fill the indent with dirt rather than clods. We did one such project on the valley floor, just north of the West Side Road. The park had sent out a water truck to spray the tracks and soften the edges before we started. The truck came back when we finished to spray again and speed up the process of filling in the tracks. A more strenuous project, in 2010, was the removal of a berm along the old Stovepipe Wells Road. The idea was to loosen up enough of the berm to allow water to flow over the road surface and hasten its return to a more natural state. This was rather hard work, as the berms were one to three feet high and didn’t yield very well to being torn apart with our heavy-duty rakes, called McLeods. Other volunteer groups also worked on them, and after a couple of years it was obvious that the work had paid off – the old road was beginning to disappear. The last time we worked in the area, in 2016, I was not able to locate where the old road had been. The Sierra Club crew did many other kinds of wilderness restoration. We did trash pick-up at three cabins: Madeline’s in South Park and two in Happy Canyon (Rita’s and the Weston Cabins). We picked up glass shards around Rita’s, hauled away junk from Madeline’s, and carried out irrigation tubing from the Weston Cabin. The latter was the most difficult of the three. There is no road to the cabin, so we had to hike from the road down a steep canyon wall. We explored the cabin and then loaded our packs with the tubing. The climb back out wasn’t easy one, but five hardy people did return for a second load. Trail work was a popular activity, because hikers would express their appreciation as they passed. On Cottonwood Canyon trail, where there were redundant paths, we cut back brush and completed some route clarification. We used stones and other materials to block some of these paths, making the main path more obvious. On the Wildrose trail we cleared several dead limbs off the trail and improved the tread in places. Heavy rainstorms in the summer of 2013 left a mass of debris on the Darwin Falls trail. Part of our work in October of that year was to clean up the path so people could hike to the falls. In January 2015, we started clearing marijuana grow sites. One site was in the Panamint Mountains and two were in the Hunter Mountain area. One of the driest places on earth seems an unlikely place to cultivate any crop, but many of the canyons have streams at least part of the year. If you’re there illegally, you are not inhibited about diverting water to a crop. The sites were always a good distance from the road and required hiking cross country. There were hundreds of yards of irrigation tubing to haul out. In addition, one of the sites had ponds constructed with plastic sheeting, and the sheeting needed to be removed. There were also structures that the growers had fashioned out of native vegetation, a few beds, and a clothesline. On one of these trips we were escorted to and from the site by a park law enforcement officer, in case the growers came back. These trips weren’t all work though. There were many fun moments. We hiked to the top of Striped Butte, and on other trips visited petroglyph sites. We especially enjoyed the chance to hike into Copper Canyon, which is only open to visitors on guided hikes. Over the evening camp fires, we have been treated to many ranger stories. If you want to deeply know a place, I recommend that you go on a service trip to that area: you’ll get a wonderful behind-the-scenes view. With Charlie’s retirement in March of 2016 (which we hear he is enjoying very much! ), we were worried that this work had come to an end. Fortunately, long term Park volunteer Birgitta Jansen has taken over coordinating service trips for the Desert Committee. So far, we have done a back country cabin assessment and some GPS marking of geological sites. There are three trips planned for the next work season. The first trip is a return to a marijuana grow site in the Panamints, where we will haul out more tubing and trash. This trip is listed in the outings section of this issue. The next two trips will be advertised when the dates are determined. Please join us in any or all of our work to assist the Park. Kate Allen is a long-time Sierra Club Leader. She is the Outings Chair for the Desert Committee and the Desert Report Outings Editor.